This is one of my dogs. His name is PiPi. 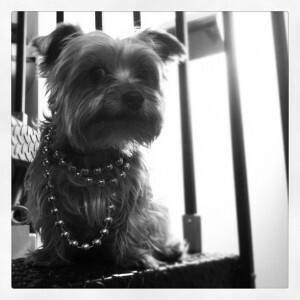 We were torturing him by making him wear beads and trying to get him to do tricks while wearing them. He would have nothing to do with any of it, thank you very much. He just sat there on the stairs with this look on his face of, "...really?" So I just grabbed a shot of him as best I could, and called it a day.